I had a lot of replies asking for advice about the best way to go about getting all the engineering materials. The answer is a simple sentence (TL;DR at the bottom), but I thought I’d expand on what I think is the smoothest/fastest way to get your ship engineered to the teeth. Inara.cz: Hands down, this is the key to (relatively) painless engineering. If you haven’t registered and linked your account on Inara, do that first. 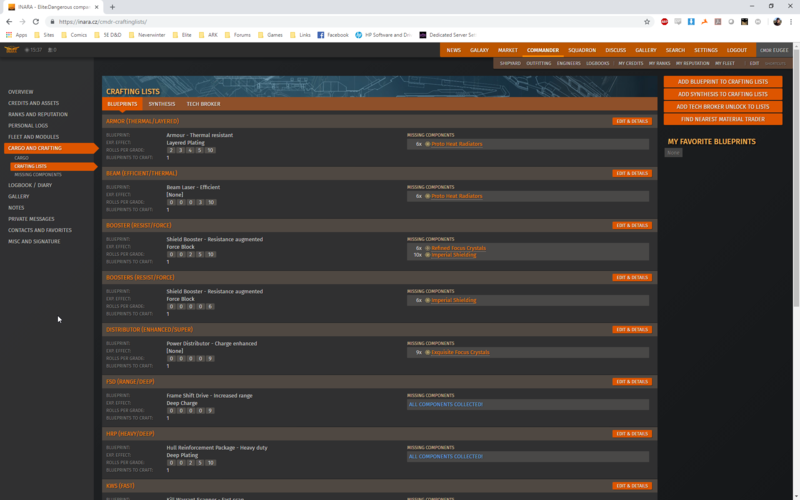 Then, if you aren’t also running ED: Market Connector, there’s a link to it on Inara under Galaxy > Inara API. Download it, set it up, and help populate all the amazing 3rd-party websites with data. With these two things done, you now have a fast and convenient way to keep your component inventory up to date automatically. It will also keep track of where you are in the galaxy, what ship you have, it’s just great. Crafting Lists: The first thing I do when I’m going to engineer a new ship is make my crafting lists on Inara. You can manually get to this list under Commander > Cargo and Crafting > Crafting Lists. There’s also quick links to it from the Engineers section. You will choose Add Blueprint to Crafting Lists, give it a name (for your reference), choose a blueprint and experimental effect, and then enter the number of rolls you will need. If you want to guarantee you have enough material when you get to the engineer, enter the Grade+1 for rolls, and Gradex2 for the max rank. For a module with no rolls yet, this will be 2 3 4 5 10. If it’s max grade 4: enter 2 3 4 8. For max grade 3: 2 3 6. Example This is the ship I’m currently engineering–a combat Vulture. Notice that on the Beam Lasers, I’m only going for 3 g4 rolls and 10 g5 rolls, and no experimental effect. That’s because I already have the experimental and I’ve already done 2 g4 rolls, and updated the crafting list to reflect that. You can also see that I have 2 shield booster lists, because i need to add Force Block to both, but I’ve already got one of them partially into g5. If I was just doing 2 shield boosters from scratch, I could put 2 3 4 5 10, force block, and set it to craft twice. One more note on the Crafting Lists. Just a single G5 roll is better than a max-G4 blueprint. You could just roll once and have a great module. If you roll 5 times, you’ll be at least 75% to the maximum the module is capable of, and have an EXCELLENT module. The last 5 rolls are probably only netting you a 5% increase or less to the module. Just food for thought. 10 g5 rolls is for a perfect module. Missing Components: This is the reason we made our Crafting Lists for the ship. Now I know not only exactly what I’m missing, but what I can trade to get it, including a mention of how much needs to be reserved. This screenshot was taken this morning, after I hit Dav’s Hope. Before that I needed a scattered collection of g1-g4 material, but as you can see I’ve got that mostly covered now. Any numbers in blue on the Missing Components page are trades in the same category. The only way I will trade up is in the same category (such as trading 6x Rare for 1x Very Rare). I will only cross-trade sideways or downgrade, when 6x G4 cross-trades for 1x G4 of a different category. I don’t trade up outside categories simply because I will need to engineer stuff again, and a 36:1 cross-trade up ratio (at best) is lousy. Bug Killer: Now that I know what materials I need to gather in order to fully engineer my ship, I want to knock my Raw and Encoded components out of the way. When you arrive in system (HIP 16613) I apologize to anyone that went to the first system I put as a typo, except the person that got a first discovery, you’re welcome :P), cruise to the planet (1 A) and because it’s not a site, you will need to do a Detailed Surface Scan of the planet to reveal the Bughunter. Or you can fly to the coordinates (-11.00, -96.68) but you should be here in your explorer ship anyway, and have a DSS on it. There are 3 comms you can data-link scan here, which yield lots of g4 (Atypical Encryption Archvies) and g5 (Adaptive Encryptors Capture) encoded material. There will also be three cargo racks you can shoot, which will drop a g4 raw material (Antimony, Ruthenium, or Tellurium) every time. You will also meet Cory. Say hello for me. Every time you relog, ED:MC is going to update your cargo on Inara for you. (If you don’t run it, you can upload your Journal.log to Inara manually, but seriously get ED:MC.) And if you refresh “Missing Components” it will show what you still need to cover your Raw/Encoded materials. I normally just reload until I fill up my g4 & g5 encoded materials, which usually takes me about 15 minutes. I’ll be able to trade for anything I need on my Raw/Encoded now. Dav’s Hope: I’m finished with the Raw/Encoded grind, so now let’s hit the Manufactured, the real grind for engineering, since it’s the material used for most G5 blueprints. On my Missing Components, I will need quite a few g4 manufactured materials, and Dav’s Hope is the place to get them. Fly to the system (Hyades Sector DR-V c2-23) and then cruise to the planet (A 5). 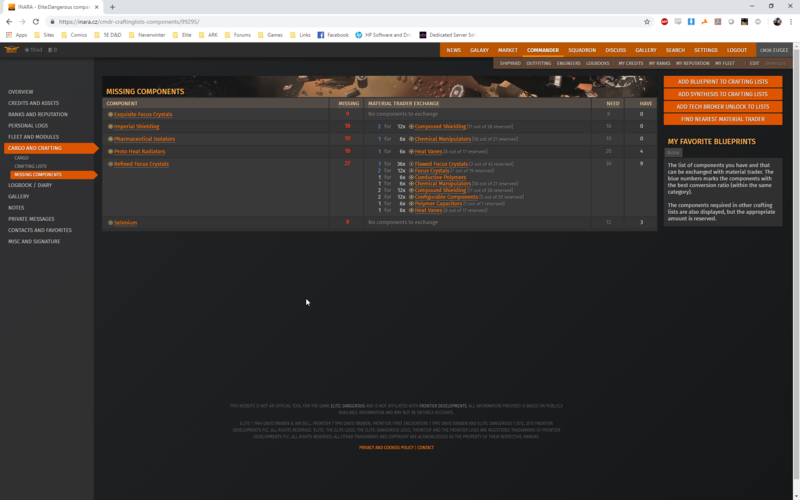 If you just honk your Discovery Scanner you will see Dav’s Hope when within 1k ls of the planet since it’s a site, but just in case you can’t find it the coordinates are (44.82, -31.39). When you arrive, land by the sign and get into your SRV. Each time you load you’re going to scan the data point, and then drive a loop around the site picking up the 10 material drops. They can range from g1 to g4, and an overhead map is included in the Canonn Research link. Here is a quick video of what a typical runlooks like for me. I will stay at Dav’s Hope, running this circuit, until my Missing Components refresh shows that I either have all of my g4 manufactured and down, or I can trade for them. HGE Farming: I’ve done a lot of work on this part to determine the best means of finding High Grade Emissions signals (guaranteed to have g5 manufactured material in them) and determined that the best way to get whatever g5 manufactured you need is to hunt for HGEs of any type, and cross-trade for what you need. The best place I’ve found to hunt for them is anywhere with a high population, with a possible slant toward Federation, Empire, or Alliance/Independent depending on if you need Core Dynamics Composites or Imperial Shielding or not. Arrive in a system, scan the nav beacon, drop/scoop the HGEs, check FSS for new spawns, then move to the next system. The Down to Earth Astronomy video I linked shows a more detailed look at how to pick systems to signal hunt in. You can use the High Grade Emissions Wiki Entry to give you an idea of what you need, or DtEA supplies a good spreadsheet as well. The bottom line I’ve found though is that it really doesn’t matter what the Faction/State shows on the HGE when you lock onto it–whatever Allegiances and States are present in the system determines what will spawn in the HGE. I have dropped into an HGE with a Federation allegiance and None state (should get Core Dynamics Composities), yet gotten Imperial Shielding (Empire allegiance). However there was a minor faction in the system that was Empire. Likewise I have gotten Military Grade Alloys (war/civil war) out of a HGE that was Empire/Boom. So I don’t worry too much about finding a specific HGE type as it’s going to be a huge crapshoot anyway. The only real decision I make is whether or not to stick to Federation or Empire space, to maximize my chance of getting Core Dynamics Composites or Imperial Shielding. If you don’t need CDC, I’d try to stick to Empire space, because an HGE with Imperial Shielding drops only Imperial Shielding; you’ll average about 12 IS per HGE. However an HGE with Core Dynamic Composites will split between that and Proprietary Composites, a grade 4, so you’ll average about 6 CDC per HGE. Visiting Engineers and Pinning Blueprints: You have to visit an engineer in order to add experimental effects. For most blueprints, even if you can’t do all of your grade 5 rolls, you could still get all the G4 out of the way, and add your experimentals. Then pin the blueprint and finish the G5 rolls remotely. Exceptions would be Selene Jean, as she does both your Armour and HRPs; I make sure I can complete the Armour before going to see her, and then pin the HRP blueprint, since I usually have multiples of that one. Using this method, I got my Federal Corvette max engineered in 4 days, and I play 3 hours a night after my family goes to bed. So if you’ve been on the fence about taking up the material grind, I can assure you that was the worst grind I’ve had for engineering yet–with 5 shield boosters, and lots of HRPs. The last thing I actually finished on it was the High Capacity(Corrosive/Emissive) small multi-cannons on it, which I ended up pinning because I finished the Overcharged on the other 3 multis right off the bat, and had to go HGE hunting for the Military Grade Capacitors. The whole grind was 15 minutes at Bug Killer, an hour at Dav’s Hope, and then three or four different trips to go HGE hunting for about an hour each time. TL;DR: Use Inara to make Crafting Lists and track Missing Components. Go to Bug Killer for 15 minutes to cover your Raw/Encoded. Go to Dav’s Hope till you have all your common to rare Manufactured. Hunt for HGEs in high population systems to cross-trade for your very rare Manufactured.